Robot Kompai is specifically designed to help the elderly and disabled with routine daily chores. (PhysOrg.com) -- A French company called, Robosoft has developed a robot called Kompai that is specifically designed to help the elderly and disabled people. Kompai can navigate autonomously, talk and understand speech. Speech is the primary means of communication; however a touch screen with simple icons can also be used for input commands. In the below video, an elderly man is shown interacting with the robot. Using the robots LCD display it only takes a few minutes of training for someone to start using Kompai. The video also demonstrates that the robot can be used for many routine chores that most of us take for granted. The first generation of the Kompai will officially be introduced next week at the Intercompany Long Term Care Insurance Conference in New Orleans from March 14-17, 2010. Kompai is currently in research and development stage and is intended for developers who would like to implement their own robotics applications for providing services to the elderly and disabled people. 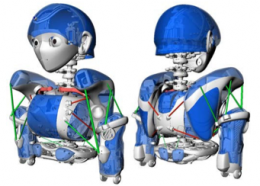 In other news on Robot Technology is Kojiro, a humanoid robot that mimics the human skeletal system. Kojiro is currently under development at the University of Tokyo’s JSK Robotics Laboratory. Kojiro is designed to mimic the way the human skeleton, muscles and tendons all work to generate motion. One of Kojiro’s main innovations is the flexible spine. Just as the human spine can bend in different directions, Kojiro’s spine is flexible also allowing it to bend in different directions and twist its torso. Robot Kojiro resembles the human skeletal structure. Kojiro uses lightweight, high-performance DC motors which are only .6 inches in diameter and 2.5 inches long. The high-performance brushless motors can deliver 40 watts of output power. The motors are used to pull cables attached to specific locations on the body. This simulates how human muscles and tendons work. 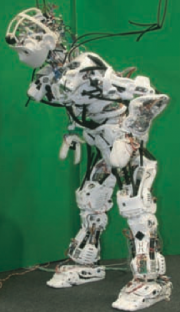 Kojiro has approximately 100 tendon-muscle structures all working together to give the robot more flexibility than could be achieved with motorized rotary joints. Kojiro seen here bending forward. Kojiro seen here bending backward. Since safety was a key concern, researchers built the robot’s body using mostly light and flexible material. Joint angle sensors are also embedded on spherical joints and six axis force sensors on the ankles. This helps keep track of Kijiro’s posture and limb positions. The video below demonstrates Kojiro in action. Lightweight and flexible material is mainly used for safety concerns. There is however one main drawback in using a musculoskeletal system and that is controlling the robot's body is difficult. This type of system introduces much nonlinearity that makes it hard to model precisely. 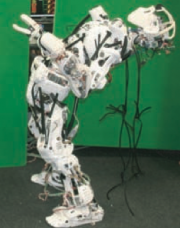 The research team can refine Kojiro’s movements only after performing many little tweaks on the control parameters until the robot is capable of handling more complex movements. The final goal is to integrate control for the head, spine, arms and legs.